Ilex glabra fruit and leaves.Darren Sheriff. Terra Bella Garden Center. “The Citrus Guy”.thecitrusguy.blogspot.com (Accessed 1/2017). 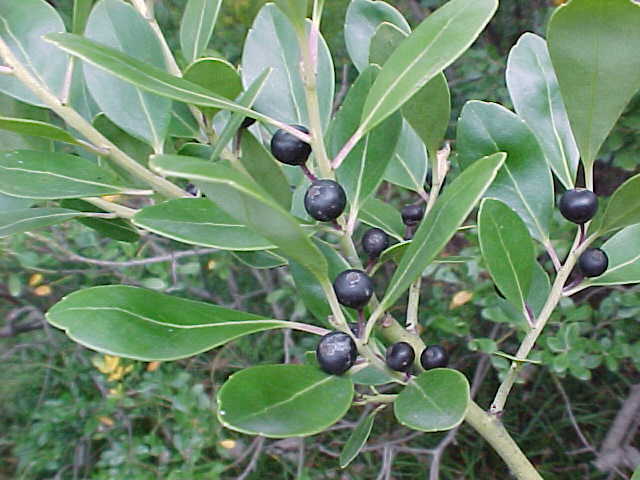 Ilex glabra is a shrub to 3 m tall, evergreen, sexes separate, somewhat colonial, twigs green, flexible, bark gray, smooth. Leaves alternate, 2-5 cm long, narrow, widest near top, shiny, leathery, tip blunt with 1-3 minute teeth, base wedge-shaped. Flowers white, small, radially symmetrical, 6-8 parted; June. Fruit fleshy, black, to 0.5 cm (on female plants); Sept.-Oct., persistent most of winter, eaten by birds, available to winter resident and spring migrant birds. Seeds about 4, eaten by small mammals. Seed load 11%. Pulp nutrients: water 68%, lipid <1%, protein, 2%, CHO 52% (White 1989), seeds, twigs eaten by deer (Martin et al. 1951). Frequency in New York City: Very infrequent. Habitat: Normally in margins of bogs and swamps of the coastal plain and pine barrens, Atlantic white cedar swamps, sandy, acid soil, pH 4.5-6. Tolerant of shade; flooding, saturated soil to 25% of growing season; salt; soil compaction. Intolerant of drought (Hightshoe 1988).